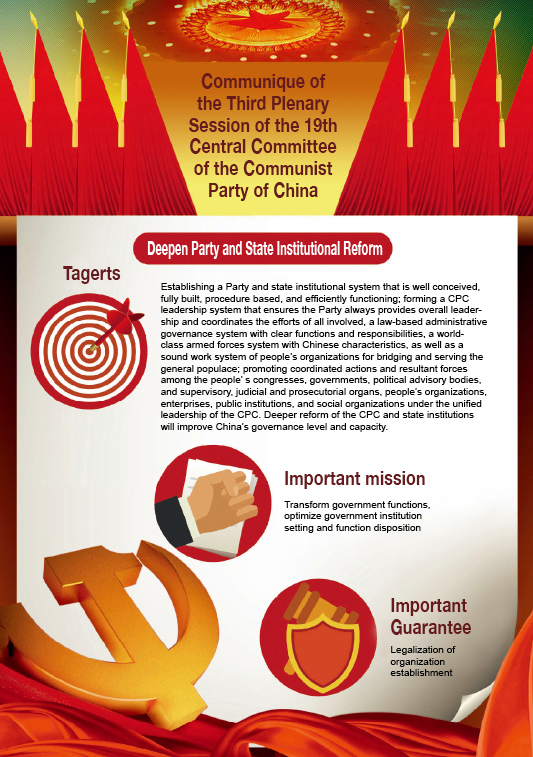 The decision and plan on deepening reform of Party and state institutions reviewed and adopted at the third plenary session of the 19th Central Committee of the Communist Party of China (CPC) (among them, the State Council Institutional Reform Program was approved at the first session of the 13th National People’s Congress) marks the eighth large-scale institutional reform since the reform and opening-up policy was implemented. Prior to this, the streamlining of institutions and the transformation of government functions, namely government institutional reforms in 1982, 1988, 1993, 1998, 2003, 2008, and 2013, have effectively promoted the development of China’s market economy, improved civil liberties, and inspired creativity throughout society. Continuous reforms have provided a steady momentum for China’s high-speed economic growth for 40 consecutive years. In 2010, China’s economic aggregate surpassed that of Japan to become the second largest in the world. In 2017, China’s GDP exceeded US $12 trillion. However, amid rapid economic growth, there are also problems such as the lack of impetus for future economic growth, environmental degradation, corruption, the gap between the rich and the poor, unbalanced regional development, and unbalanced urban and rural development. Since the 18th National Congress of the CPC in 2012, General Secretary Xi Jinping proposed the requirement of comprehensively promoting socialist economic, political, cultural, and social development, ecological progress, and Party building. When China’s modernization enters a new historical stage, through continuous reforms, these issues will be addressed. At the same time, in the Party and state institutions and the public sector, there are still problems such as overlapping organizations, overlapping responsibilities, separation of powers and responsibilities, laws and regulations being enforced in a non-standard and low efficiency manner, to name a few. The division of powers and responsibilities between centrally administered agencies and local authorities, and some of the current structure and functions of Party and state institutions are not reasonable. In particular, the structure and functions of local institutions have been difficult to adapt to the needs of the rapid economic and social development, so it is urgent to make the top-level design and carry out holistic reforms. 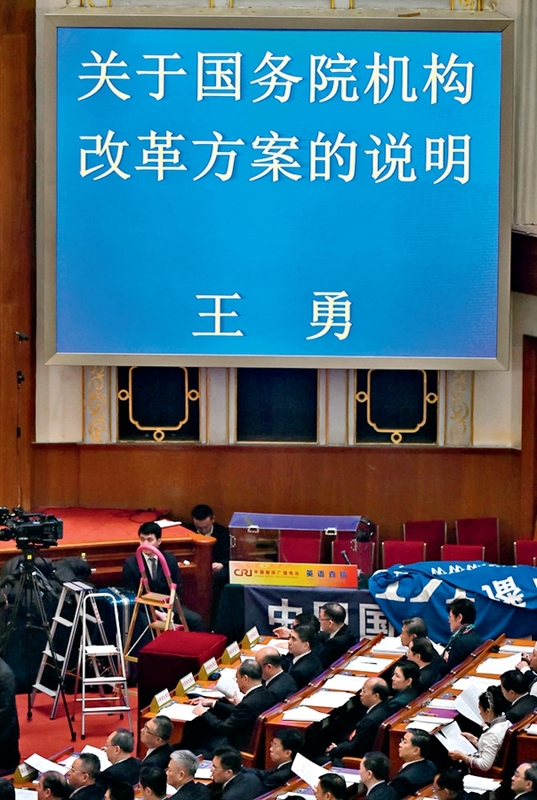 The new round of institutional reform was carried out under the pretext that Xi Jinping Thought on Socialism with Chinese Characteristics for a New Era was set as a guiding principle that the Party must adhere to for a long time and on the occasion that marks the 40th anniversary of the reform and opening-up policy. The purpose is to carry through reform in the new historical era, comprehensively modernize the country’s system and capacity for governance, and improve the capability to implement Xi Jinping’s governing strategy in the new era. The first is to promote the reform of the Party, government and military institutions, and mass organizations, so as to enhance their ability of coordinated governance under the CPC’s unified leadership. Different from the previous institutional reforms that were mainly limited to the administrative sector, this reform emphasizes the overall arrangement of functions and structures of various departments and internal organs of the Party, government, military and mass organizations, with an aim to enhance the leadership of the Party, improve the executive ability of the government, kindle the vitality of social organizations, improve the combat capacity of the military, and promote coordinated actions among the people’s congresses, governments, political advisory bodies, and supervisory, judicial and prosecutorial organs, people’s organizations, enterprises, public institutions, and social organizations under the unified leadership of the CPC, so as to improve China’s governance level and capacity. The second is to make overall planning of institutional reforms of the central and local governments, build a smooth and vigorous work system of central and local institutions, in which orders are executed without fail. Based on the rational division of central and local powers and responsibilities, the central authorities should strengthen macro-management by making national development strategies and plans, and local authorities are asked to do their jobs well on the condition of carrying out orders from the top thoroughly, ensuring effective implementation of the central government’s policies and national laws and regulations. The setup of local institutions and their respective functions must be in line with local conditions, and local autonomy and governance capabilities should be enhanced. Governments at the village and township levels, as well as at sub-district and community levels are responsible for integrating resources, and improving services and management in terms of examination and approval, and law enforcement, with an aim to provide convenient services to the people and enterprises. State Councilor Wang Yong speaks at the fourth plenary meeting of the first session of the 13th National People’s Congress (NPC) at the Great Hall of the People in Beijing on March 13, 2018. The third is to optimize the structure and functions of government institutions. It was proposed to implement a “super ministry” management, which means streamlining government department functions and to form some “bigger departments” to improve overall management. In principle, one department should take charge of one affair. The relevant organizations should cooperate with each other. On the one hand, the overlapping of institutions, duplication of functions, and overlapping of responsibilities should be resolved to avoid multiple leadership, unclear responsibilities, and irresponsibility. On the other hand, it is important to establish a Party and state institutional functioning system that is well conceived, fully built, procedure based, and efficiently functioning, with resources more integrated, powers and responsibilities more coordinated, supervision more effective, and operations more efficient. The fourth is to balance and coordinate the division of labor and power in decision-making, implementation, and supervision. The primary task of this reform is to strengthen the leadership, organizing capacity, and decision-making power of the CPC and its organizations in the national governance system, so it can carry out top-level design and overall plan to boost advancement of major tasks in the new era. Through the legislative work of the National People’s Congress, the reform and development advances under a legal framework. The focus of integrated and collaborative governance among the government, the judicial organs, and the public sector is to improve the executive ability, efficiency, and service level. The newly established National Supervisory Commission integrates various supervisory functions and forces, which enjoys relatively independent inspection and supervisory right over all civil servants who exercise public power, but it does not enjoy judicial power and judicial authority. This institutional reform is the largest, most comprehensive, and systematic reform since Deng Xiaoping initiated the reform and opening-up policy, which is expected to fully unleash the dividends of reforms of China’s economic and social development. Streamlining administration and delegating power will remove institutional barriers so the market plays the decisive role in resource allocation. With a free market, stimulated social vitality, further opening-up, and better and more efficient government services, a more relaxed environment for citizens’ employment and entrepreneurship, and for business operations and innovation will be established. The government’s unified planning and strengthened supervision will help reduce market disorder, protect intellectual property rights, and guarantee fair competition, so as to create a healthier and more mature market. This institutional reform will also comprehensively upgrade the ability of China’s leadership with Xi Jinping as the core to implement their policies and strategies. The formation of a centralized and unified governance system with rational division of labor, optimized functions, and coordinated and efficient operation will help implementing the policies of reducing financial and real estate risks, protecting the ecological environment, eradicating poverty, vigorously improving people’s livelihood, and promoting economic transformation and upgrading, which can meet the people’s growing needs for a better life. The reform of the national supervising system and the formation of the national supervision law will legally consolidate the achievements of the anti-corruption efforts since the 18th CPC National Congress and form a unified, authoritative, and highly effective anti-corruption system with Chinese characteristics, which promotes all civil servants to be clean and honest and all institutions to perform their duties according to the law. The unified leadership and enhanced macro-coordinating capabilities are conducive to narrowing the gap between the rich and the poor, achieving balanced regional development, coordinated development of urban and rural areas, and the integration of military and civilian developments, so as to promote well-rounded human development, all-round social progress, and common prosperity for everyone. Dong Xiaoyu is deputy director of the Government Research Center of Beijing Administration Institute.